21-year-old Sunderland defender Jimmy Dunne talks about comparisons with Steve Staunton, his international prospects and lining out at Wembley Way. 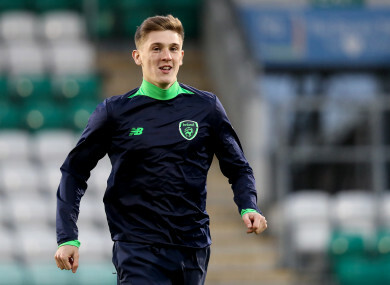 Jimmy Dunne on Ireland U21 duty. UNTIL JIMMY DUNNE’S career settles into its groove, there will be endless comparisons to Steve Staunton. Both from Dundalk, both De La Salle College alumni and both defenders. Replicating the feats of the Liverpool legend is certainly something he’d love to achieve, 102 caps for Ireland et al, but there are key differences. For Dunne, to be within “touching distance” of his country’s senior squad is an achievement in itself given the hurdles he’s had to overcome. After all, at 16 and not long into his spell at Manchester United, an injury plague set in leading to a double hip operation and 13 arduous months on the sideline. The mental toll, for one so young, was significant. On a compassionate level, in a crocked state far away from family and home, the experience was brutal. “I’d totally moved my life for football, but all of a sudden I was living there and not playing football,” he tells The42. “It kind of felt almost pointless until I began my rehab. “The toughest thing is the mental state it can leave you in, especially at that age. I know a lot of the older players have gone through it and know how to deal with it, but I found it really tough. His courage is admirable and evidenced by the manner in which he has responded to having another tonne of bricks collapse on his dreams. The Louth man’s release by United “broke” him, leaving the side he had dreamed of playing for, the only club he knew. So near. So far. Armed, however, with a determination that could be confused with stubbornness, a transfer to another Premier League outfit, Burnley, transpired and, while the topic didn’t enter the fray, the sense is that things couldn’t have worked out much better. Seán Dyche, the Lancashire club’s unmistakable, gruffly-spoken coach, has given him a platform from which to forge a career that he’s grateful for, even if it’s contrary to the one he pictured when making the move across the water alongside Conor Masterson of Liverpool. The pathway vision he was given view to at Turf Moor consisted of getting out on loan, which he has done — going firstly to non-league Barrow in the autumn of 2017 before catching the eye of League Two Accrington Stanley last January. There, in the jaws of England’s Football League, a boy became a man. It’s tough as a young defender, it’s hard to gain the respect of managers. “A lot of players find themselves in a scenario where they have to go lower first and I needed to do that to gain my experience because you only really learn where you are at and how you can improve by playing games. “That’s where Accrington came in and I got that opportunity. I think they were seven [points] from the top at the time, but we went on a great run and that was my first taste of ‘I’m actually playing for more of a purpose than just myself’. It was like: ‘what do we want to do?’ ‘We want to win the league’. A title-winning run, ultimately, the biggest achievement in the club’s history, and done under former Sligo Rovers boss John Coleman. Dunne’s physical edge, and competency on the ball, was a trademark of that spell, and something he remains recognisable for. But then his grounding was solid. The mutual background point of every great Irish defender has been their playing of GAA as a child and Dunne, a classy centre-forward for both club [Geraldines] and school up until United came calling, is no different in this sense. Thus, now at Sunderland and battling for promotion to the Championship, a Wembley date in a fortnight’s time, as glamorous as a Checkatrade Trophy final against Portsmouth sounds, hasn’t the deep-down impact one would imagine. It’s no Croke Park… but it’s not bad,” he quips. And, in a way, it’ll crown a season which began at Hearts with a bolt to the summit of the Scottish Premiership. With the aim of getting out of his “comfort zone”, August interest from the Edinburgh giants yielded a six-month loan deal, during which time his displays earned him top reviews on a weekly basis. He scored a few goals, too, and had a Twitter page set-up in his honour. All the while Dunne, who never played for Ireland at underage level, was being picked in Noel King’s U21 squad without getting game-time. His first cap, in any grade, came in last October’s European Championships qualifier against Germany, a 2-0 defeat, but Dunne’s form at club level hadn’t escaped the attention of senior boss Martin O’Neill, who called the towering centre-half into his final panel for November’s Nations League encounter with Denmark in Aarhus. “I basically had no international football at a young age and it’s hard being 18 and playing for Man United every week wondering why I wasn’t being involved with my country, so it became something that I couldn’t focus my attention on. “But the experience was great when it came. It’s valuable for a 21-year-old at the time to watch and see how players and managers react. “You learn as much as you can from them so that in the future you’ll know what you’re doing more. Mick McCarthy then named him in his provisional squad for the upcoming European qualifiers, and while he didn’t make the 23-man cut, Dunne, without revealing too much, says that he knows where he stands. This, it seems, provides comfort and allows him to concentrate at the immediate tasks at hand, Wembley and promotion. Injury forced the early termination of his time at Tynecastle, but Jack Ross wasn’t shy in looking to take Dunne to Sunderland upon his recovery and he’s been a mainstay since January, ensuring that he remained in the international picture. “Luton [league leaders] are obviously doing really, really well, but I wouldn’t say that it’d be impossible to catch them, with nine games and 27 points to play for, anything can happen,” he says of the Black Cats’ current situation. “Wembley will be a really good occasion and we want to win it, of course, but getting the club promoted is a big deal. “Sunderland, they’re not in the position where the fans or anybody involved with the club wants them to be. But the Sunderland I know is the League One Sunderland, which is not the Sunderland the fans are familiar with. Thereafter, for Dunne, it’ll be about discovering where he belongs. The breakthrough of Dwight McNeil, a fellow ex-Man United youngster, gives him hope of making it at his parent club, even if the margins are so fine. Nonetheless, his dramatic rise from Holker Street and Barrow to Wembley and Sunderland in less than 18 months suggests a player of real potential. Email “'I'm within touching distance and it's nice to have that recognition from my country'”. Feedback on “'I'm within touching distance and it's nice to have that recognition from my country'”.